Watch the Video for "Sleepover" here. Available on this site, or at Newbury Comics, Amazon, Tower Records, and many other places. Just as bears hibernate for the winter, we're taking a break from touring. See you next year. The Fest 5 in Gainesville FL is coming up Halloween weekend. We'll be playing on Sat. Oct. 28 at the Atlantic, 11:10pm SHARP! Check out www.thefestfl.com for the rest of the band schedules and more info. We'll be on tour with Fifth Hour Hero the week prior, and doing some dates on our own in florida and the east coast the week afterward. We'll be heading off soon with our labelmates The Modern Day Saint. Check our tour page for shows on the east coast and midwest. 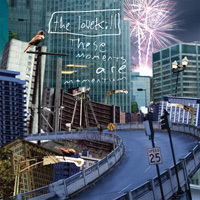 Our new album These Moments Are Momentum is officially released today. Available at Newbury Comics, Amazon, Tower Records, and many other places, as well as at all of our shows. Go to Altpress.com to hear an exclusive streaming of the new album. Only one week before the official release! Newbury Comics is offering a special pre-release of our album--buy These Moments Are Momentum, and get the Sleepover EP for FREE. Our tour with The Felix Culpa is only a couple of weeks away. Check out the shows page for more details. We'll be playing on the Warped Tour's Hot Topic Kevin Says stage, on four of the tour's midwest stops this summer. Check the shows page for dates and places. Played in Minneapolis last night with Thursday and Milemarker. Geoff Rickly was sick, so his band had to play without him. The audience sang all the words. Everyone seemed to have a great time, despite the disappointment. Milemarker is awesome. Buy their new record. Back from the west coast, and getting ready for more shows this weekend. A little hometown love on saturday, our fave Chicago on sunday, and so looking forward to playing with Thursday and Milemarker on monday in Minneapolis. Video shoot day in Los Angeles. Unconstructed third floor of an old medical building. Pipes and wires hanging loose. Lots of dirt on the floor. In San Fran, met up with George Rager, brother of Chris. That dude is awesome. We made it out to California. Hanging out and playing some great shows with the Valley Arena. We're also going to be shooting a video for the song Sleepover while we're out here. Warren from the Valley Arena and the animation artist Robo will be putting it all together. We're featured in this months' Alternative Press as one of the 100 Bands You Need to Know in 2006. Check it out on the newsstands. West Coast tour coming up! Shows in PA, NY, and OH. Click here for more details. Back from the Continent--Will post photos soon. The Lovekill is featured on a new CD sampler issued by Germany's OX Magazine. We're track number 1, oh boy. Returned from our tour. Florida rocked. Nakatomi Plaza rocked harder. Thanks to Tony and Var and Jason for making The Fest in Gainesville truly awesome. To all our friends, it was great to see you. Fat Wreck Chords is releasing a compilation CD on Oct. 18, and we're on it. Protect: A Benefit for The National Association to Protect Children features songs from Matt Skiba (Alkaline Trio), MxPx, Jawbreaker, Against Me!, Hot Cross, The Soviettes, and many others.